More than 200 students from 33 universities gathered Saturday afternoon to attend HackNY‘s fall Hackathon at New York University‘s Courant Institute of Mathematical Sciences. Fourteen companies, including Meetup, Aviary and Drop.io, demoed their APIs before students settled into couches and chairs to brainstorm ideas while noshing on catered burritos. HackNY, a non-profit dedicated to getting students involved in the city’s start-up culture, organized the hackathon, which also marks the end of NYU Startup Week, a series of panels and events hosted by the student organization Tech@NYU. Chris Wiggins of Columbia University, Hilary Mason of bit.ly and Evan Korth of NYU founded HackNY in February and held its first hackathon in early April. Winning teams presented their hacks to a sold-out auditorium of more than 700 geeks at the New York Tech Meetup the following week. Tonight, about a dozen ambassadors volunteered to hang out answering programming questions, including David Tisch of TechStars New York, 4Chan‘s Christopher “moot” Poole, Rich Frankel of Track.com and Michael Myers from the Examiner.com. 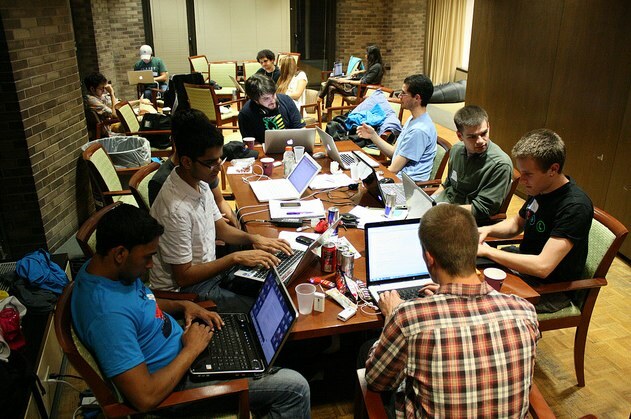 Students hacked overnight, many fighting off sleep to code up to the deadline, fueled by caffeine, snacks and a round of ice cream served at 3am. Here are a few projects that look interesting so far. Paul Kernfeld, Justin Ardini and David Trejo from Brown University are building an interactive game many people can play using their phone keypads. Players dial into the game using Twilio and control tanks on a large screen by pressing appropriate numbers, essentially using their phones as video game controllers. The game is inspired by the classic Scorched Earth for DOS and allows more people to play simultaneously than would be possible with a normal game console. From Columbia University, Kui Tang, Zhehao Mao, Tanay Jaiburia, Sid Nair, Cecilia Schudel and Moses Nakamura are building a recommendation engine for groups using Hunch’s API as a solution to the tedious question of “where should we all eat tonight?” The hack assembles the tastes of each group member, balancing them out to recommend something everyone can agree on. The group plans to place more weight on dislikes than likes to avoid suggesting anything a group member might loathe. Ian Jablonowski from Rutgers is building an alarm clock that catches you up on what you missed while you were sleeping. Built using Twilio, Twitter and as many services as Jablonowski can incorporate before deadline, the alarm clock calls you in the morning to tell you what’s happening, what’s in the news, and what events you might be interested in that day. Tal Safran and Max Stoller of NYU are using Foursquare to log check-in data for NYU buildings. They aim to learn who the university’s main community members are and who is the mayor of NYU as a whole. The team’s hack will track which buildings log the most check-ins and offer badges unique to NYU. The idea is to have any organization be able to find their own community by identifying venues and assigning them to the community. Check out more photos from the hackathon here.